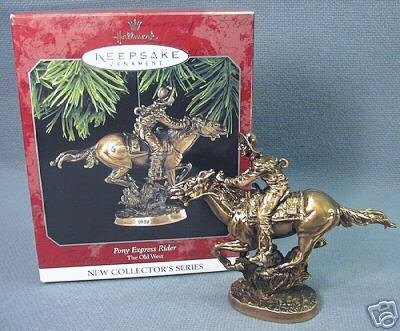 1998 Hallmark Keepsake Ornament Pony Express Rider ~~The Old West from The Old West Series,first in the series. This seems to be made of metal? with a bronze finish.This measures 3 1/2" high. Items Similar To "Hallmark 1998 Pony Express Rider The Old West 1st #1"